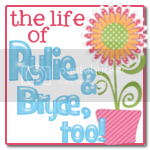 Blog Spotlight | The Life of Rylie…and Bryce Too! I’m LeeAnn. A full-time working mom of 2. Married to the best husband anyone could ever ask for. My beautiful little girl Rylie is 2 1/2 and is a little ball of energy! She is a friend magnet and just has the best personality. Well, when she isn’t throwing a tantrum worthy of category 5 hurricane status, that is. My adorable not-so-little boy Bryce is 10 months and is the happiest baby you will ever meet. He can light up anyone’s day with his sweet little smile. I am constantly on the go and never seem to have enough time. I’m learning all about being a mom as I go, and loving every minute of it! My only hobby is my obsession with blogging and all the fun that comes with it. My blog started out as just a way for me to keep family and friends updated on the kids. I post about all of our fun times as a family of 4. I use it as a journal of the kids’ milestones, since I haven’t even opened a baby book since Rylie was about 10 months old. Shortly after I started my blog I discovered the wonderful community of bloggers, and that brought some weekly meme fun, reviews and giveaways to my blog. Since January of this year, so about 7 months. I just signed in to Blogger and took off! I started writing posts about the kids. Anything family friendly. I have had giveaways for baby/kid products, jewelry, accessories and household items. I haven’t had all that many, and I can’t really say that one was my favorite over the others. I learn something from each one, and I have enjoyed them all! My family and friends, of course. But I think it mostly appeals to other parents. I honestly don’t want it to change too much. I would love to get more involved with reviews and giveaways, but I also want to keep writing about what I really love…my kids. Time! I am so glad my blog has so many loyal followers! I try to respond to comments and get around to all of the blogs I love, and I have found myself buried in it all. I really wish I had more time to spend, but I do what I can. The ability to brag about my kids without feeling like an AW. I also love all of the wonderful bloggers I have met. This is seriously a great community, and I am so happy to be a part of it! Kind of. Lately I have come across a TON of blog hops. I love blog hops and I think they are great for getting your blog out there and meeting some new people. When I participate in a blog hop I always follow the “rules” that the host(s) sets and when I visit a new blog I really take the time to look at it. Not everyone does that, though. It almost makes me sad to get a comment like “I am following you from such-and-such blog hop…follow me back.” Don’t get me wrong, I am glad to have a new follower, but I would be even happier if that person actually took a look around on my blog…they might find something they like! My only advice for the readers entering my giveaways is to read the directions, and make sure you do the mandatory entry so that your other entries count. And PLEASE leave me your email address if it isn’t in your profile. As far as newbie review bloggers…well since I’m one myself, I don’t really have advice. But I guess I will just say to have fun with it, and if it starts to get overwhelming, take a step back, or even a break. Well Stacie, your blog has been a wealth of information to me lately, so you are definitely on that list. 🙂 But since there are really too many to mention here, head on over to my blog to see my list of My Favorite Blogs. I really enjoyed this entry! Thank you, Stacie! Thanks again! Have a great weekend!